Hezbollah chief Sheikh Hassan Nasrallah has said he would not have ordered the capture of two Israeli soldiers if he had known it would lead to such a war. "Had we known that the kidnapping of the soldiers would have led to this, we would definitely not have done it," he said in an interview on Lebanese TV. He added that neither side was "heading towards a second round" of fighting. 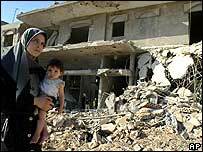 More than 1,000 Lebanese died in the 34-day conflict which left much of southern Lebanon in ruins. The Israeli offensive began after two Israeli soldiers were seized during a cross border raid by Hezbollah militants on 12 July. "We did not think that there was a 1% chance that the kidnapping would lead to a war of this scale and magnitude," Sheikh Nasrallah said. "Now you ask me if this was 11 July and there was a 1% chance that the kidnapping would lead to a war like the one that has taken place, would you go ahead with the kidnapping? "I would say no, definitely not, for humanitarian, moral, social, security, military and political reasons. 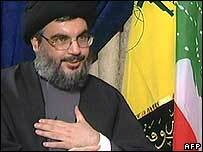 "Neither I, Hezbollah, prisoners in Israeli jails and nor the families of the prisoners would accept it." Sheikh Nasrallah was speaking on the eve of a visit to Beirut by United Nations Secretary General Kofi Annan to discuss the expanded UN peacekeeping force to be deployed in southern Lebanon. A force of 15,000 soldiers, 7,000 of them from European Union states, will be deployed to maintain the fragile ceasefire between Israel and Hezbollah. The UN hopes to have some of the troops on the ground within a week, although the foreign minister of Finland – which currently holds the EU presidency – has said it will be two to three months before the whole force is deployed. The force will be led by France until February, at which time Italy will take command. Speaking in Brussels on Friday, Mr Annan said the plan would only work if the enlarged UN force, called Unifil 2, was "strong, credible and robust". Mr Annan said the force offered the possibility of a "durable ceasefire and long-term solution" to the Middle East crisis. The UN flag gives a sense of safety to people in the war-hit southern Lebanon. Mayor Bloomberg Just Vetoed The Community Safety Act.